This Creamy Chicken Gnocchi Soup Recipe is easy to make thanks to the crockpot! Plus, it’s rich and hearty without any heavy cream! Packed with white beans and vegetables, this soup is comforting, yet healthy and the perfect dinner any day of the week! This post was originally published in February 2018. I’ve updated the post below to include more information about this gnocchi soup. Plus, I added a recipe video to show you how easy this chicken gnocchi soup recipe is to make! Happy last Thursday of February! I feel like I say this all the time, but obviously I like to repeat myself… can you BELIEVE how quickly time flies by? I mean, we are only a little over 3 weeks away from the first day of spring!! Please tell me I’m not the only one flabbergasted over the fact that time is so fleeting?! Anyways, with that said, we must eat ALL the soups till we can’t eat no mo’. Because before we know it, it will be summer and outside will be hotter than a firecracker on the fourth of July. 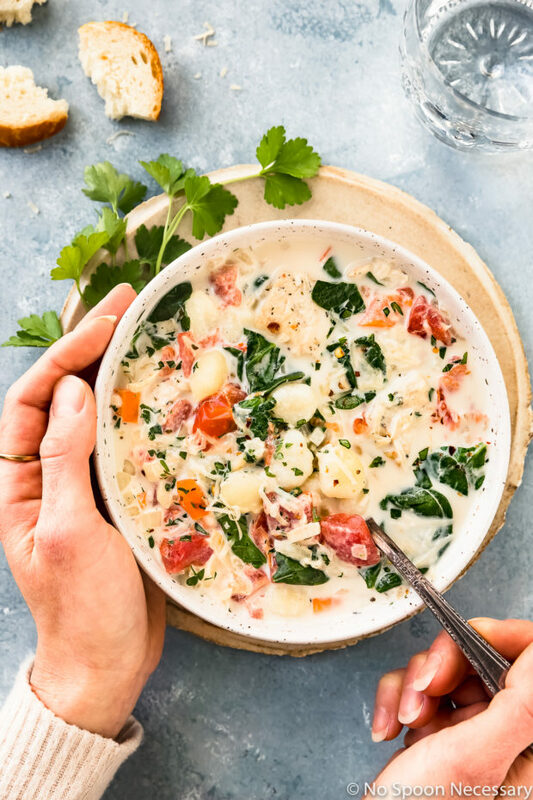 Silky smooth based soup loaded with tender chunks of chicken breast, pillow-y soft gnocchi, and fresh spinach; studded with crunchy carrots, mellow onions, diced tomatoes, buttery white beans and herbaceous Italian seasonings. This soup is creamy-dreamy, hearty and comforting, yet light and fresh. 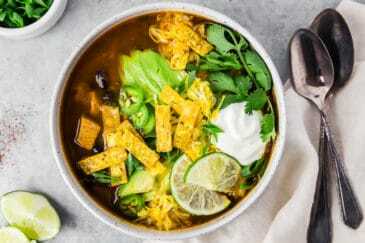 And aside from being SOUP-ERB in the taste department, it’s also an absolute BREEZE to throw together thanks to your trusty crockpot or slow cooker. Gnocchi are soft dough dumplings made from potatoes, flour and egg yolks. The dough is (most often) rolled out, then cut into small pieces and pressed with a fork to make tiny ridges. 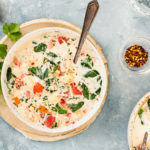 I used mini gnocchi in this slow cooker creamy chicken gnocchi soup recipe, because they are more bite size and suited for soup. You should be able to find mini potato gnocchi in the pasta isle of most major grocery stores. However, if you cannot, feel free to substitute regular sized gnocchi! You pronounce gnocchi as N(Y)OK-ee or NOH-Kee. While the origin for the word is unknown, it is speculated to have come from the Italian word nocca, meaning knuckle. Where is gnocchi found in the grocery store? You can find gnocchi in most major, or specialty grocery stores. Gnocchi is usually located in the pasta aisle, near the spaghetti and noodles, but can also be found fresh in the refrigerated section, or frozen in the freezer food section near the frozen ravioli. You can use any type of gnocchi in this creamy gnocchi soup, but I typically use dried or fresh. If you are using frozen gnocchi, make sure you do not thaw them first. 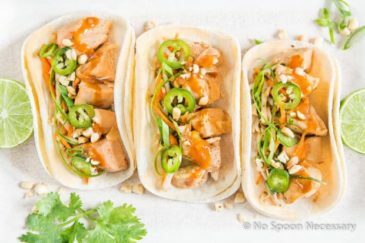 You can substitute boneless skinless chicken thighs for chicken breasts if desired. Just make sure you cut the chicken into bite sized cubes, regardless of what cut of chicken you use. You can either use chicken broth or chicken stock in this recipe. I used chicken broth since the recipe also calls for evaporated milk, and I felt the milk gave the soup plenty of rich mouthfeel. While the recipe calls for evaporated milk to save a few calories, you can absolutely substitute half-and-half or heavy cream if you are looking for an even richer soup. If spinach isn’t your thing, kale is a delicious substitution. While this Crockpot Chicken Gnocchi Soup reheats well, the gnocchi will soak up a good amount of the liquid during storage. Therefore you may need to add more evaporated milk (or half-and-half or heavy cream depending on what you used in the soup) when reheating. The amount of liquid you add will depend entirely on how much soup you are reheating and how “soupy” of a consistency you are looking for. What to serve with gnocchi soup? 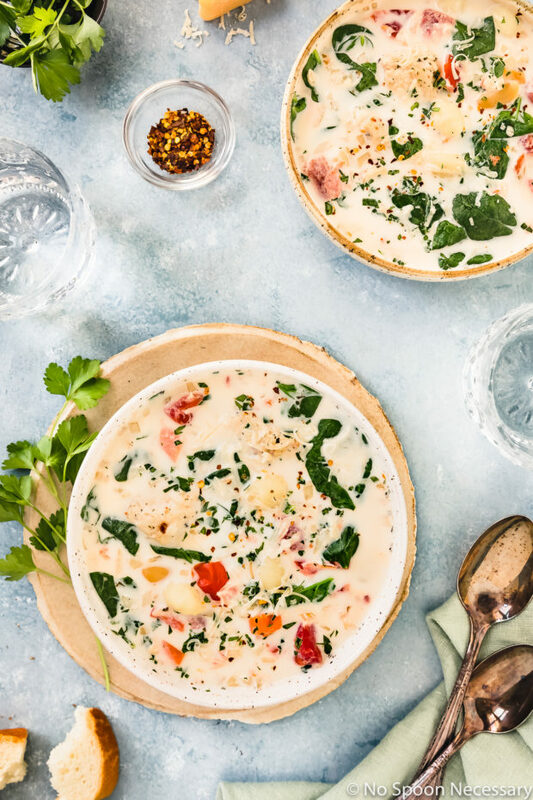 This creamy chicken gnocchi soup is packed with protein, veggies and carbs, and eats like a complete meal. However, if you are looking for a few sides to serve with this crockpot soup, below are some delicious options! How long is chicken gnocchi soup good for? Leftover soup should be stored in an airtight container in the refrigerator. Properly stored, creamy gnocchi soup will keep for up to 3-4 days. Can chicken gnocchi soup be frozen? Chicken and gnocchi soup can be frozen. To freeze, allow the soup to cool completely before transferring to a freezer-safe zip-closure bag or air-tight container. Properly stored, Tuscan gnocchi soup will keep in the freezer for up to 2 months. 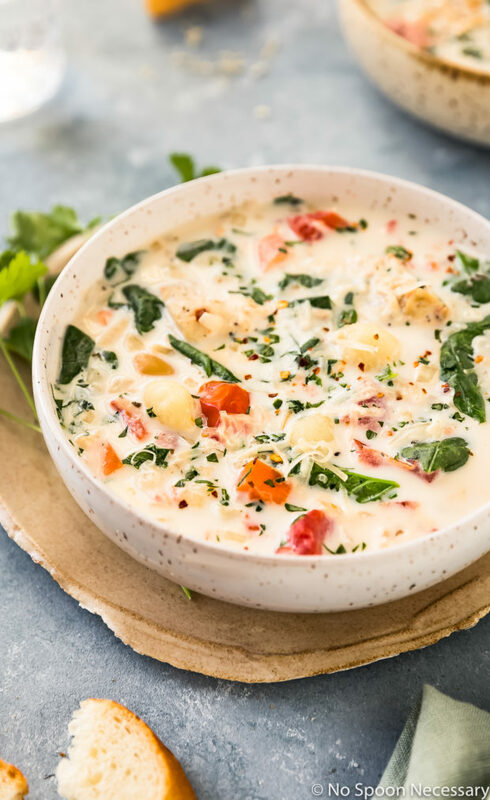 To reheat creamy gnocchi soup, allow it to defrost overnight in the refrigerator and then reheat over low heat, stirring frequently. Make sure you avoid boiling the soup. Since the soup will become thicker during storage, you can add a little half-and-half while reheating to reach desired consistency. 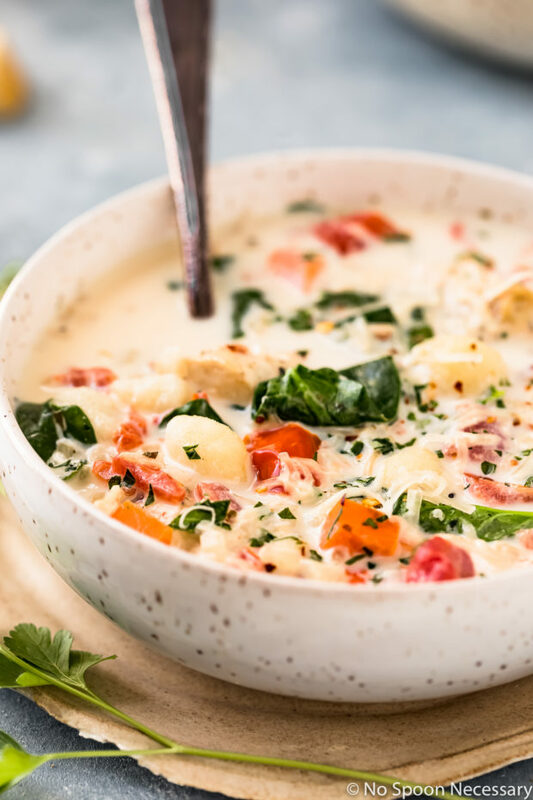 Hearty, yet made without any heavy cream and with the convenience of the crockpot, this Creamy Chicken Gnocchi Soup Recipe is a weeknight dinner winner! Until next week friends, cheers – to skinnier soup for the soul! This Slow Cooker Creamy Chicken Gnocchi Soup is rich and hearty without any heavy cream! Made with the convenience of the slow cooker, and packed with white beans and vegetables, this soup is cozy, yet healthy and the perfect dinner any day of the week! Place the chicken, onion, carrots, garlic, parmesan rind (if using), tomatoes, broth, Italian seasoning, basil, red pepper flakes, salt and pepper into the bowl a slow cooker or crockpot and stir to combine*. Add the evaporated milk, white beans and cornstarch (dissolved in water) to the slow cooker. Stir well to combine. Cover and cook on HIGH for an additional 30 minutes, or until the soup is slightly thickened. Add in the gnocchi and continue to cook on HIGH for 20-30 minutes, or until softened. Stir in the spinach, cover the slow cooker and cook until spinach is wilted, about 5-10 minutes. Taste and adjust the soup for seasoning with salt and pepper. Serve immediately topped with fresh parmesan and optional garnishes if using. Enjoy! While this soup reheats well, the gnocchi will soak up a good amount of the liquid during storage. Therefore you may need to add more evaporated milk (or half-and-half or heavy cream depending on what you used in the soup) when reheating. The amount of liquid you add will depend entirely on how much soup you are reheating and how “soupy” of a consistency you are looking for. 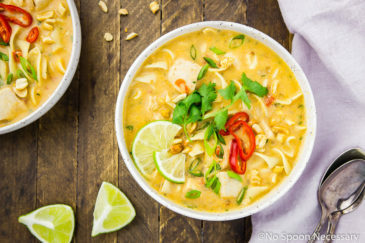 What a cozy, comforting soup! Love the flavors and love, love, love the gnocchi in it! I was just thinking today of how much I like Tuscan Chicken and wouldn’t that be good as a soup – and voilà! – it’s even lovelier than my imagination! I would like to take this to a potluck at work, but make it the night before and store in the fridge. Would it be best then, to wait til the day of the potluck to add the gnocchi and the spinach after first warming up the main part of the soup at work? Or could I just do it all at home and then reheat it in the crockpot at work the next day, but bring along more evaporated milk in case it’s too thick? I would definitely wait to add the gnocchi and spinach. If you make it fully according to the recipe and then reheat it (with the gnocchi and spinach already added), the gnocchi will disintegrate and the spinach will be entirely overcooked and taste bitter. I hope that answers your question!! Let me know if you have any others. Cheers! So do you cook the chicken for 2 hours first then add everything else? I’m just not fallowing the recipe no matter how many times i read it. Also, what do you mean when you say put the chicken through the black pepper? Step 1 – “Place the chicken through ground black pepper” means place all the ingredients in the ingredient list from chicken through black pepper into the slow cooker. In other words, place the chicken, onion, carrots, garlic, tomatoes, broth and seasonings into the slow cooker. Hopefully that answers both of your questions! Let me know if you need further clarification or if you have any additional questions. I’m always here to help. Cheers! All ingredients are listed in order of use. You add the broth, etc in the first step – “Place the chicken through pepper in a slow cooker or crockpot. Cover and cook on HIGH for 1 ½ – 2 ½ hours or LOW for 3 ½ – 4 ½ hours.” Let me know if you have any other questions. I’m always here to help. Cheers! I LOVE gnocchi but can you believe that I’ve never had it in soup? 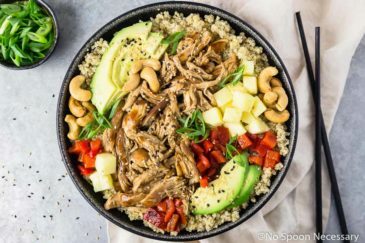 I need to change that and I love that you can whip this up easily in the slow cooker! I have yet to get a slow cooker (and I’m behind on the instapot craze as well) but I’m such a soup fan that I think I need to make the leap and get one. Love that you’re using gnocchi in this – they are such delicious little dumplings! Hope you’re having a great weekend, Cheyanne! OMG gnocchi soup! Gnocchi are one of my favorite things to order at an Italian restaurant. I LOVE them. I never thought of putting them in soup. And I’d like to say I’ll use the evaporated milk, but I’ll probably use cream. I’m just a sucker for a rich creamy soup I guess. I’ll eat healthy another day! I feel like it’s only hot here in CA now, so I;m just going to eat soup all year round. Say what? Gnocchi soup?! Ouch, sorry for being rude. Hi Chey. You’re so right about time flying. And although I’m so ready for spring, I’m enjoying comfort meals as much as possible as spring and summer are reserved for salads. Now let’s talk about important matters. Gnocchi soup? I know tortellini soup (Which I’m embarrassed to say I’ve never made), but gnocchi soup is a new level to me. Sounds and looks fantastic! I am with you on eating as much soup as possible before spring hits! It snowed here today, so yeah! for soup weather!! Love the flavors going on here and that dreamy creamy texture! + Gnocchi for the win! I agree that time is flying Chey, but I can’t wait til it’s as hot as a firecracker on the 4th of July!! You know I LOVE summer! And I love this soup, and that it’s for the slow cooker. I love the addition of the evaporated milk instead of the heavy cream too. This is one hearty soup that’s perfect for these remaining days of winter! Happy weekend! This looks super comforting and delicious! Have never thought of using slow cooker to make gnocchi soup…a brilliant idea!